WITH more than 30 years' shared experience in the wine industry, brothers Joshua and Simon Schmidt (pictured) have won over crowds with a new concept that has the potential to revolutionise the favourite tipple as we know it. 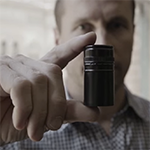 The duo has taken out first prize in the Brancott Estate Winexplorer Innovation Challenge with a screw-cap concept that allows consumers to tailor wines to individual tastes at the push of a button. When activated, the closure releases a solution that binds with the particles in the wine, resulting in the ability to reduce the effects of preservatives or to subtly enhance the flavour. As the co-founders of Vinnovate, a wine and beverage innovation startup, the brothers believe this level of personal customisation will gain in popularity. "Being able to customise beverages is the next big consumer trend, and we believe our innovation can positively impact how people enjoy and consume wine," says Joshua Schmidt. "While it is still early days, the companies and industry leaders we've been speaking to are taking note of the trend towards consumer customisation and they've been extremely positive about what we've created." Vinnovate was one of more than 100 entrants into the Winexplorer Challenge and the only South Australian team to break through into the finals. Schmidt says winning the competition boosted the concept and has given the team a prime starting point on the road to securing their niche, drawing interest from industry professionals and consumers alike. "We believe that the Winexplorer Challenge has validated our idea and it now gives us a springboard from which to go forward," says Schmidt. "There were some great companies involved, so we're thrilled to be taking an all-South Australian wine innovation to the world." Vinnovate's concept has been applauded by officials including Australian Master of Wine Phil Reedman who believes the company name says it all, particularly in an industry known for sticking closely to its guns. "Vinnovate's name sums it up; innovation in wine," says Reedman. "Wine can be a pretty staid business but their solution, which gives wine drinkers the option to reduce preservatives in their product, offers a breakthrough." South Australian Manufacturing and Innovation Minister Kyam Maher has awarded Vinnovate $100,000 in micro finance to develop its idea, citing the importance of supporting entrepreneurs in the state. "At a time when South Australia's economy is transitioning from traditional manufacturing to high-tech and high-value manufacturing, companies such as Vinnovate are setting the standard for our innovators and entrepreneurs," says Maher. The University of South Australia, where Simon Schmidt is currently undertaking his MBA, has also commended the brothers' flair for business.